Tsukuba, Japan, Mar 12, 2018 - (ACN Newswire) - Three-dimensional printing offers unique advantages, but still faces many challenges, for fabricating small, flexible robots that can navigate through the human body and other confined spaces, according to a review in the journal Science and Technology of Advanced Materials. Researchers at South Korea's Jeju National University examined the latest research and developments in fabricating soft robots using 3D printing technologies. Their study concludes that 3D printing is well suited to build robots that have complex external shapes together with an internally porous structure. Even so, the field is still new and major gaps must be addressed in order to print robots with multiple materials that readily adhere to each other. Many 3D printing technologies are available. They all convert digital data into three-dimensional objects by adding successive layers of a material until the object is fabricated. The printing technologies use different types of materials and approaches for layering them. 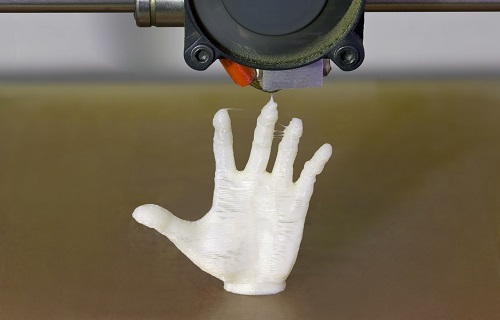 For example, researchers used 'selective laser sintering' of powdered metals to develop a multi-finger soft robotic hand that can lift, grip, spin and precisely position objects. Soft robots are being tested for a variety of purposes inside and outside the human body. For example, a 3D printed soft silicone pump could be used as an artificial heart. 3D printed soft 'micro-biobots', which can travel through blood vessels or the gut, are being researched for monitoring diseases. Outside the body, soft robots are being developed for prosthetics, for monitoring vital signs, and for organ-on-a-chip devices that can replace animals in drug testing.